I'll never forget the first time I saw Munger Place, it was Mother's Day (my first one), and we were just driving around Old East Dallas. I thought to myself "Wouldn't it be cool to go to church in such a beautiful old building?" From the outside, it looked like it was a very traditional church, the kind that sings from the hymnal with no instruments, doesn't have community groups or many service opportunities, and is really hard to get plugged into. I was looking for a church similar to our church in Austin, which was a very eclectic mix of people, focused on serving and sharing the love of God with the community, it was also pretty young and vibrant, and they loved to rock out on Sunday mornings. So past Munger, we drove, and we didn't consider visiting. At the time, I was in a dark, lonely place. Not long before then, my husband and I had just had our first baby, who was born with a very rare cranial defect and required surgery and monthly visits to the neurosurgeon in San Antonio. With all the medical bills, we couldn't afford for me to quit my job to stay home and care for our son. So we moved to Dallas from Austin for a new job and left my family, our church community, and some of our closest friends. We left most of our support system in Austin, and to top everything, I had postpartum depression and had no idea or time to address it. It was rough. My husband was working his tail off and traveling quite a bit for his new job too so that coupled with the depression made me feel super bitter towards him. I felt like he and I were in this dark, empty room together, sitting apart, unable to move closer to each other. Over the next month, we visited church after church, and never felt at home anywhere. My husband kept bringing up Munger Place and suggesting we try it out. So, I looked it up online. I actually looked it up on Instagram first, and through the #Mungerplacechurch hashtag I found a picture of a mariachi band from the Easter service. It looked so fun! And it caught me off guard. The pictures portrayed this joyful, involved community of people that were serving and worshipping alongside each other and having a great time doing it. I kicked myself for making assumptions and writing it off when we drove past. We attended for the first time that next Sunday. While it was different from our church in Austin, I felt like these were the kind of people I could worship with and be in community with. Very open, non-judgmental, servant-hearted people, who also happened to love rocking out on Sunday mornings. It took us a few months to get plugged in. Munger Place is a bigger church than I was used to, and I realized that you have to be intentional and proactive if you want to get involved in larger church. The turning point came when we joined a small group. That first night we went around introducing ourselves and telling each other why we joined a small group. I discovered that everyone else was looking for exactly what we were looking for: community. As each person went around and spoke, it felt like they were walking into that dark, empty room with my husband and me, and for the first time in a year, we were no longer alone. God knew what he was doing when he put each of us in that group, together, at that precise time. We were all going through some struggle and feeling alone, and we had each just been trying to hold it together on our own for too long. The other thing I have come to realize is that the more you do at Munger Place (and any church for that matter), the more other opportunities to get involved arise. That small group was the very first thing, and man, it was hard to put ourselves out there and join that small group. But the more we went, the more we found other ways to get involved and the more people we met and on and on. Now Munger Place is like our family. We're no longer in that dark, empty room because all our people don't fit in there. The beauty of the building still amazes me, but it pales in comparison to the beauty of what's going on inside that building. There is so much love, so much redemption, and so much joy. A few weeks ago, Andrew Forrest, the Pastor of Munger Place asked me to paint a new backdrop for the church's sanctuary. 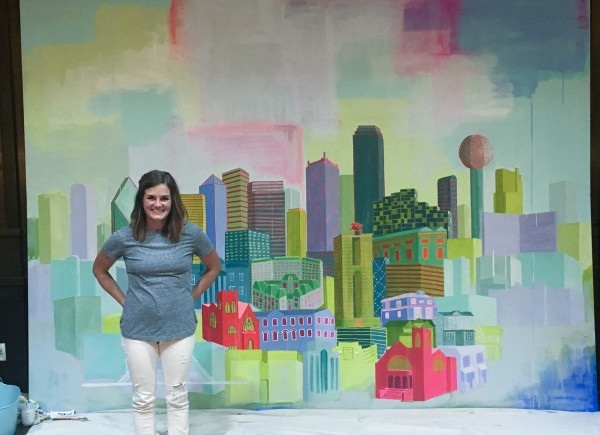 When we were discussing what the painting should look like, I knew I wanted to paint the City of Dallas, because the focus of Munger's ministry is serving the city. Andrew asked me, "What would our city look like if it were lit up with the Holy Spirit?" His question was intriguing; I liked how it sounded and immediately thought of ways to illustrate it. So I painted Munger Place Church bright pink. The bright colors 'lit up' the church against the other buildings along the Dallas skyline. I painted Highland Park United Methodist Church bright pink too, because HPUMC is Munger’s parent congregation, and without it, Munger would not be what it is today. I wanted to make it seem like the Holy Spirit was arising, flowing from these two churches. That's why the details and ‘lights' on the other buildings are lit with the same bright pink and red colors. Munger Place Church has been a beacon of light in the dark for my family and me, and I know it has been for many other people as well. I feel so blessed that I get to be a part of it and that I get to do this painting and illustrate what Munger Place has done for me and is doing throughout the City of Dallas.